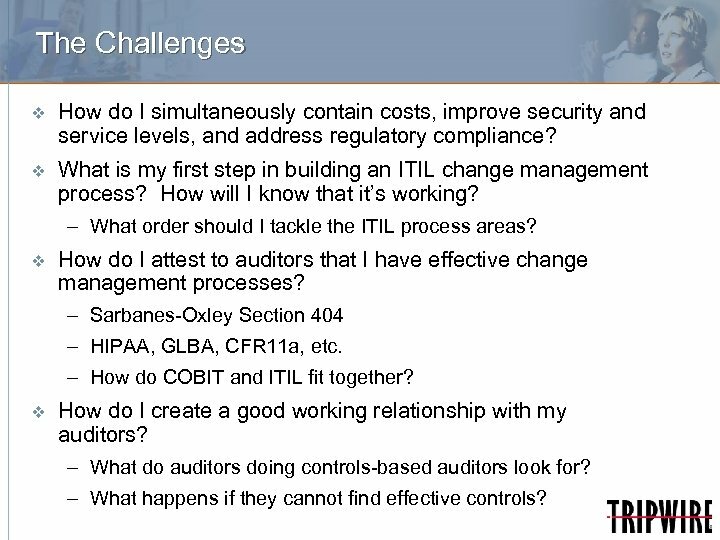 The Challenges v How do I simultaneously contain costs, improve security and service levels, and address regulatory compliance? 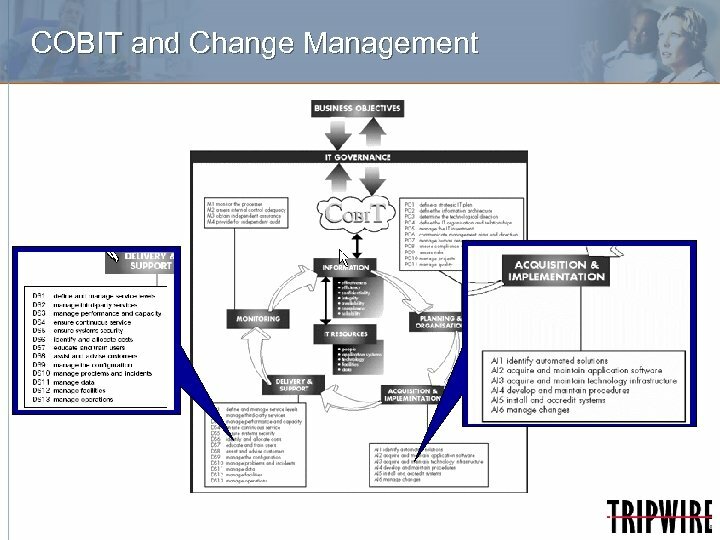 v What is my first step in building an ITIL change management process? How will I know that it’s working? 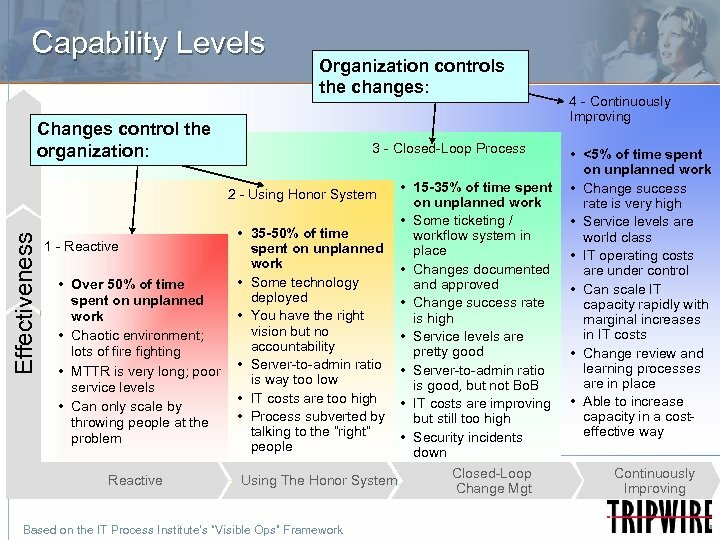 – What order should I tackle the ITIL process areas? 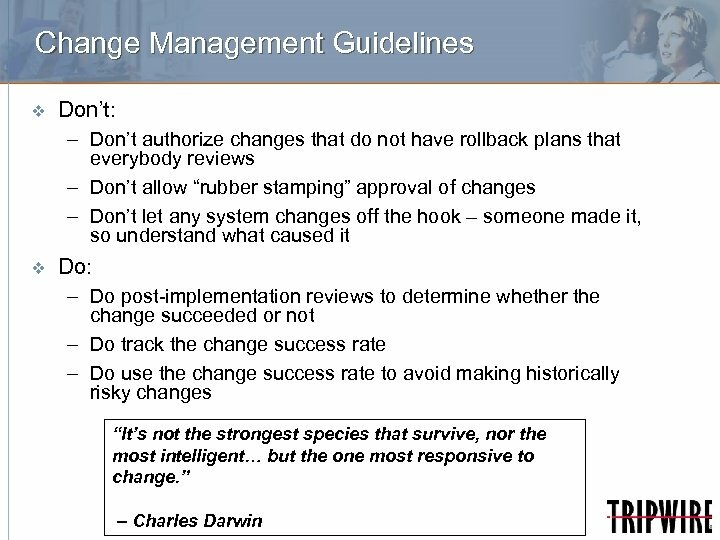 v How do I attest to auditors that I have effective change management processes? 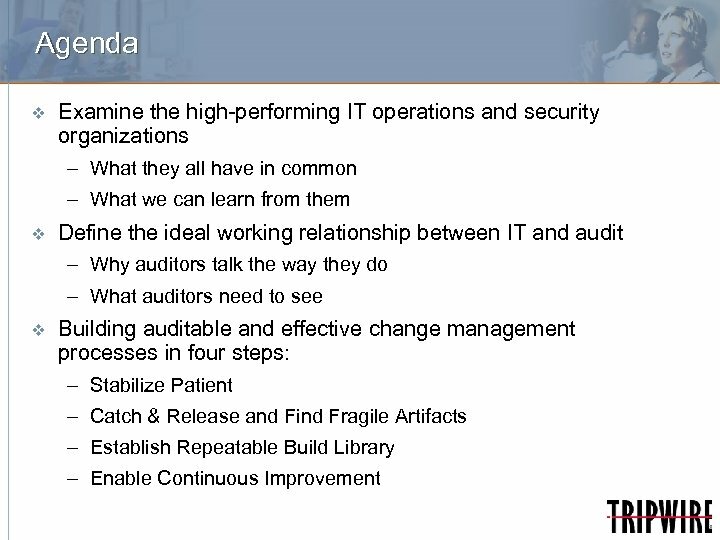 – Sarbanes-Oxley Section 404 – HIPAA, GLBA, CFR 11 a, etc. 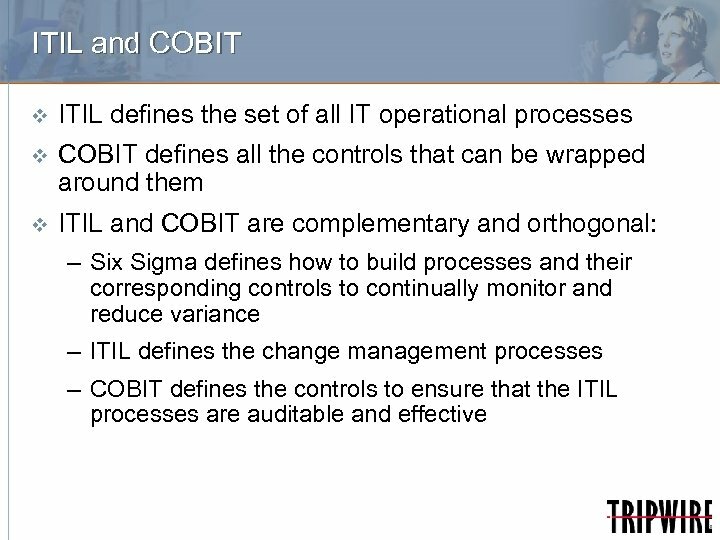 – How do COBIT and ITIL fit together? 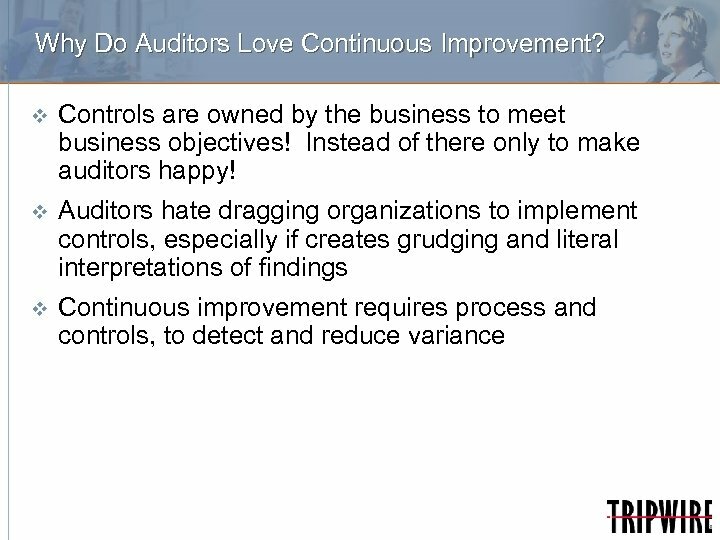 v How do I create a good working relationship with my auditors? 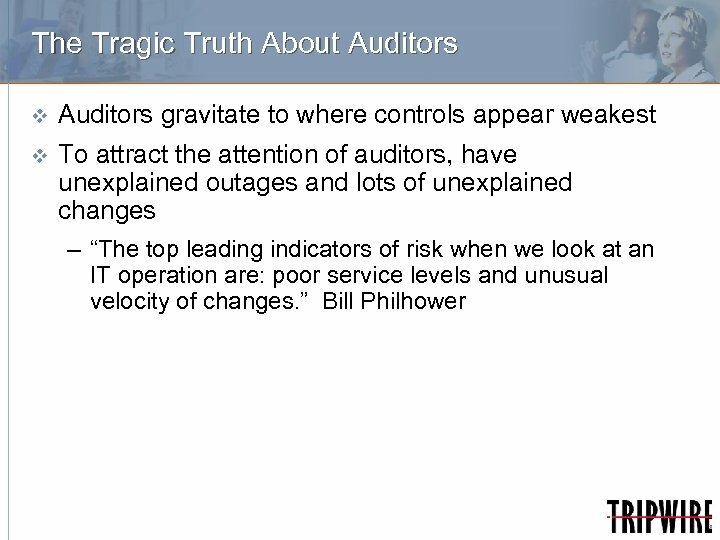 – What do auditors doing controls-based auditors look for? 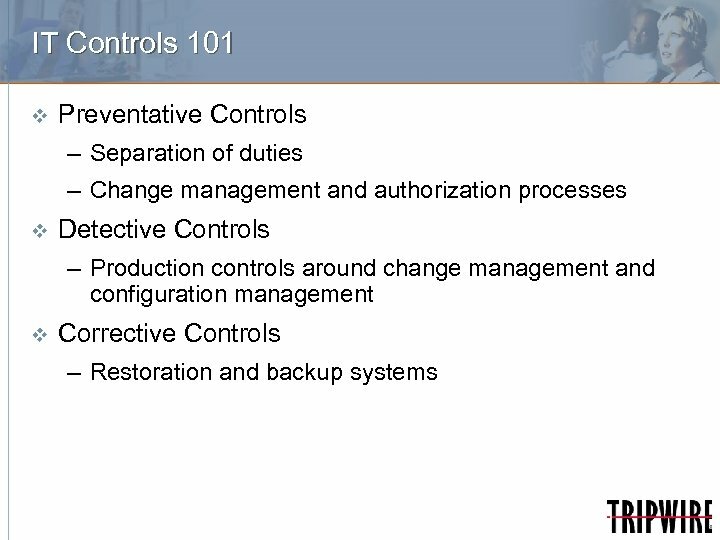 – What happens if they cannot find effective controls? 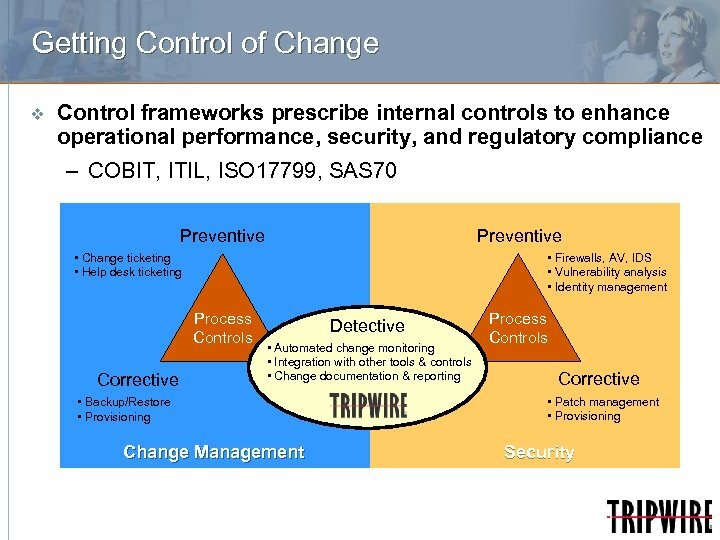 COBIT AI 6: Managing Changes Control Objective Tripwire’s Role 6. 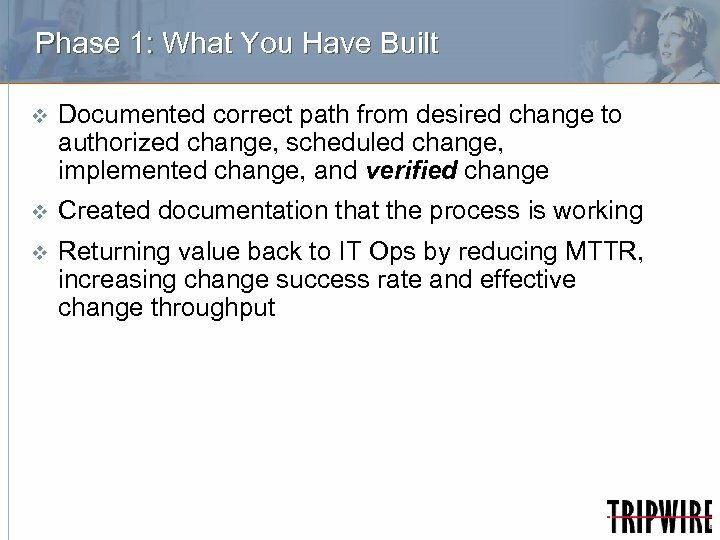 5 Documentation and Procedures Tripwire is used to validate that all changes are tracked, synchronized with documentation (run books, etc. 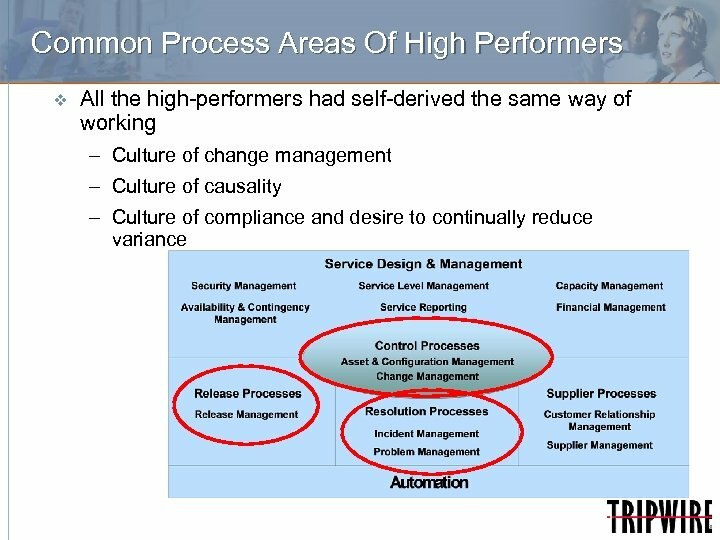 ), and applied consistently across the appropriate systems. 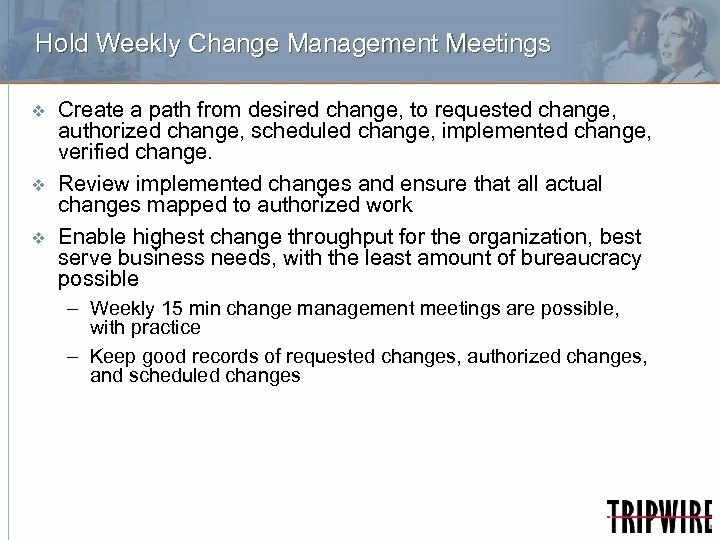 The change process should ensure that whenever system changes are implemented, the associated documentation and procedures are updated accordingly. 6. 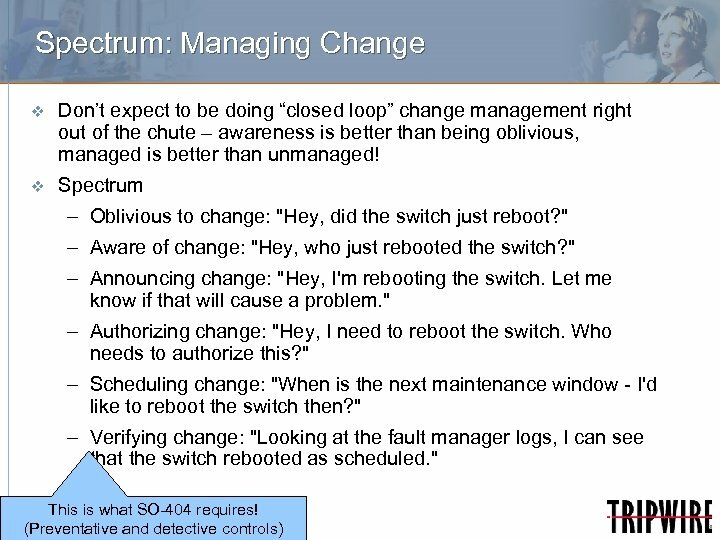 6 Authorised Maintenance IT management should ensure maintenance personnel have specific assignments and that their work is properly monitored. 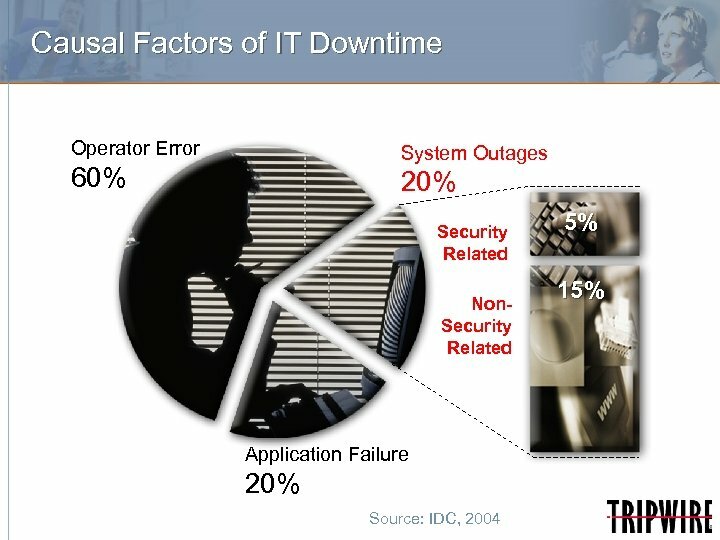 In addition, their system access rights should be controlled to avoid risks of unauthorised access to automated systems. 6. 7 Software Release Policy IT management should ensure that the release of software is governed by formal procedures ensuring sign-off, packaging, regression testing, handover, etc. 6. 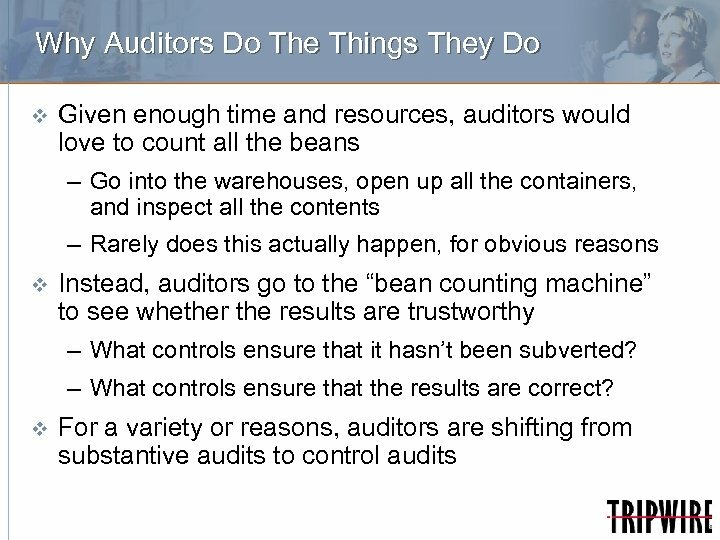 8 Distribution of Software Specific internal control measures should be established to ensure distribution of the correct software element to the right place, with integrity, and in a timely manner with adequate audit trails. 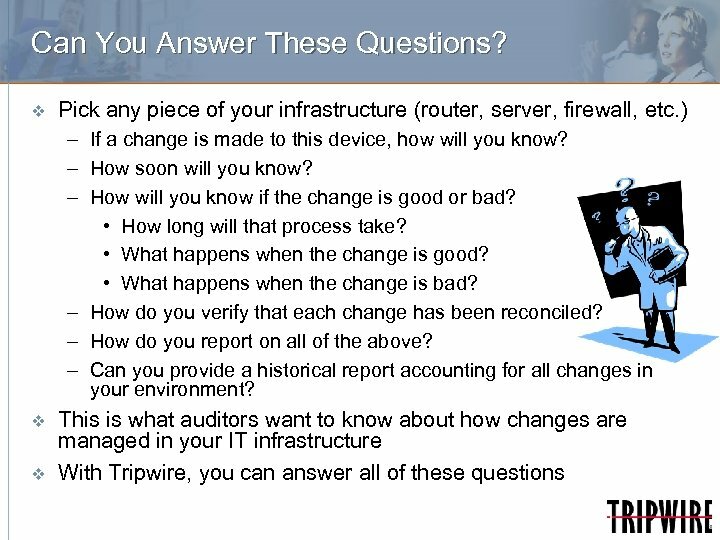 By reporting what changed on each system, when it occurred, and who made the change, Tripwire is used to ensure that all changes made are authorized, and made by authorized personnel. 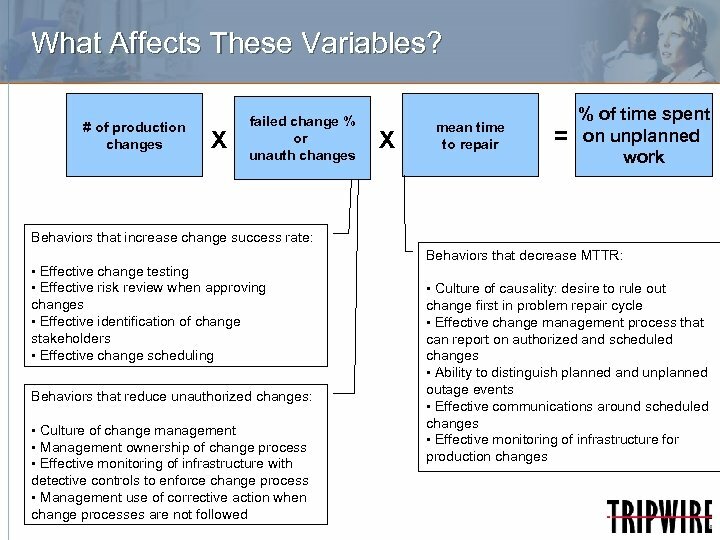 “Out of scope” changes, inconsistently applied changes, changes that occur outside the maintenance window, and other inappropriate changes are therefore discovered before they impact system availability. 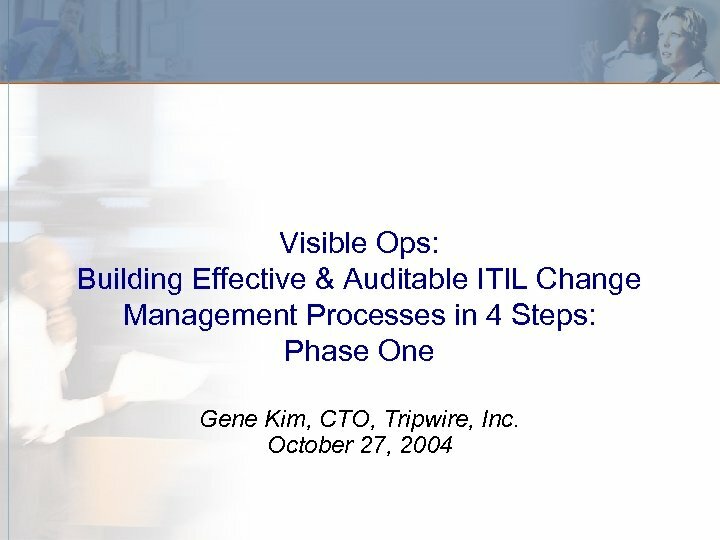 Tripwire enables IT management to validate that formal sign-off processes are adhered to. 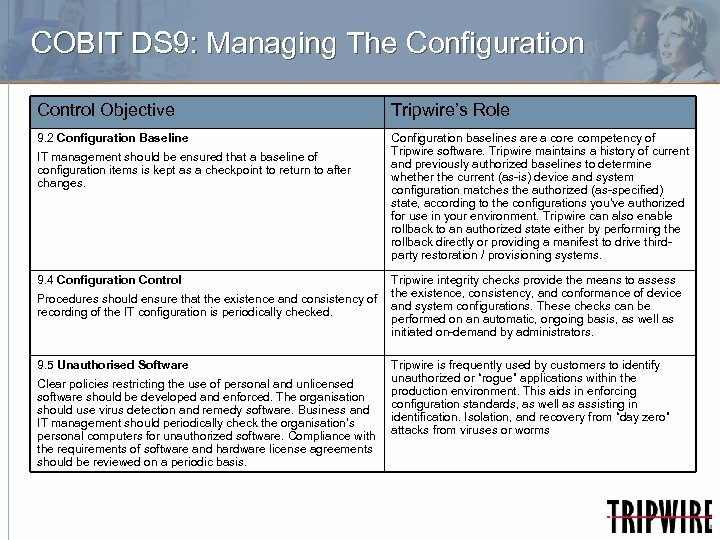 Tripwire is also commonly used to ensure that packages are not altered during handoffs (through pre- and post- handoff comparison of released packages). 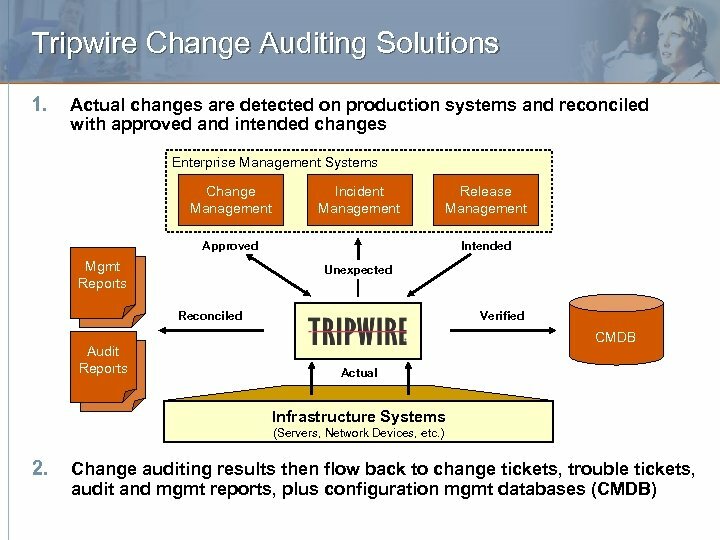 Tripwire can compare changes that occur on production systems back to a reference baseline to ensure that software distribution happens consistently across target systems, within the prescribed time. 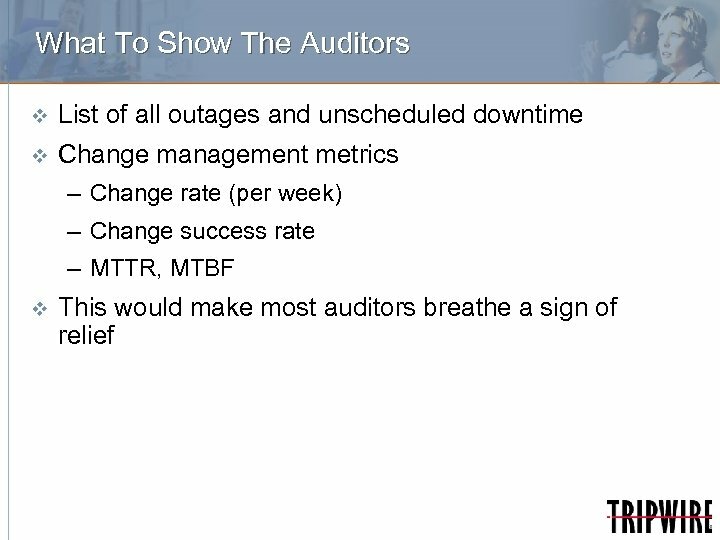 All changes are recorded for historical and audit-related reporting and analysis. 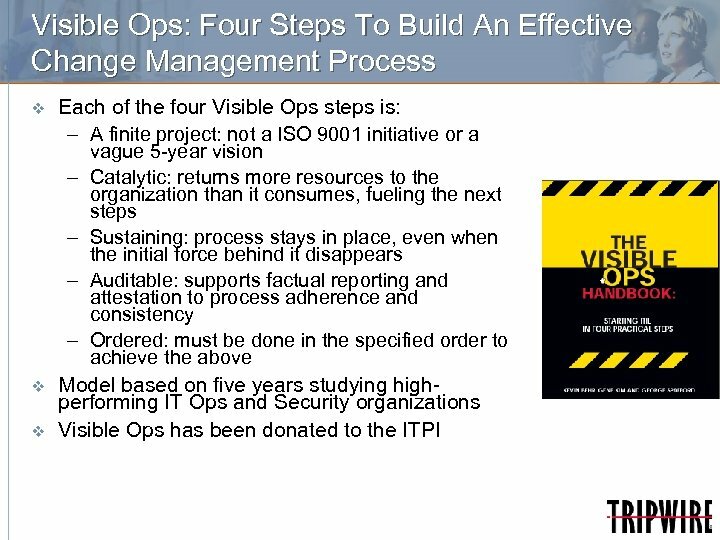 Visible Ops: Four Steps To Build An Effective Change Management Process Phase 2: Catch and Release, Find Fragile Artifacts Phase 3: Establish Repeatable Build Library Tripwire captures known good state in preproduction. 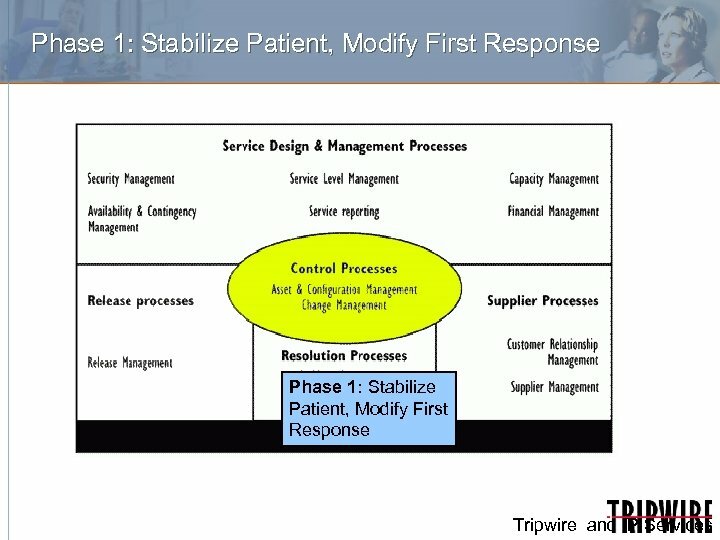 Tripwire captures production changes that need to be baked into the build. 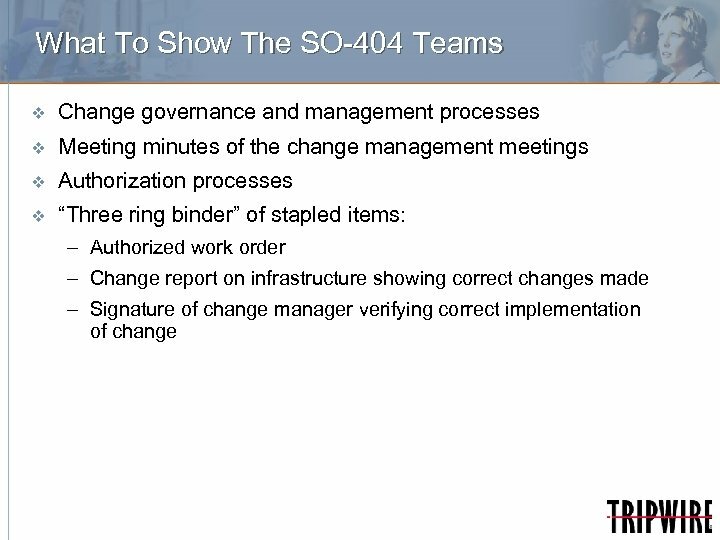 Phase 4: Continually improve Tripwire detects change, which all process areas hinge upon. Tripwire protects fragile artifacts. Phase 1: Electrify Fence, Modify First Response Tripwire enforces the change process. 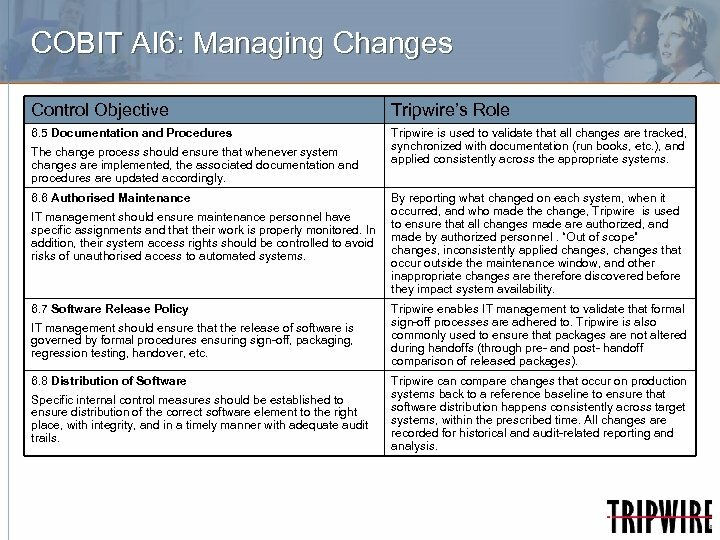 Tripwire rules out change as early as possible in the repair cycle. 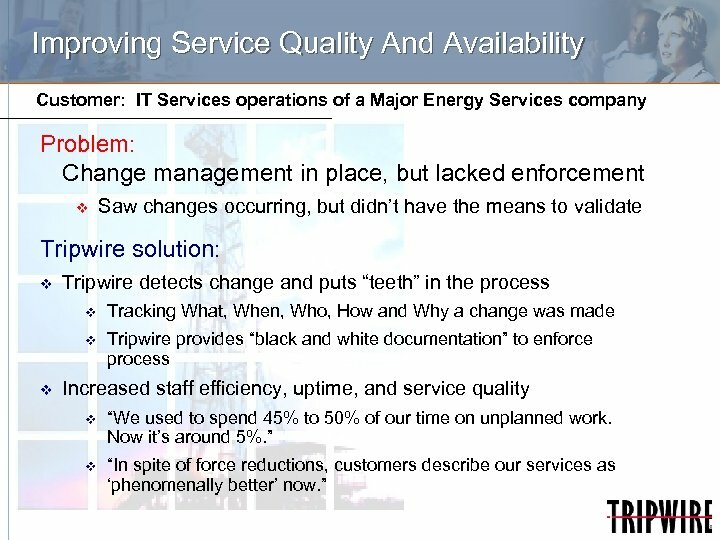 Tripwire enforces change freeze and prevents configuration drift. 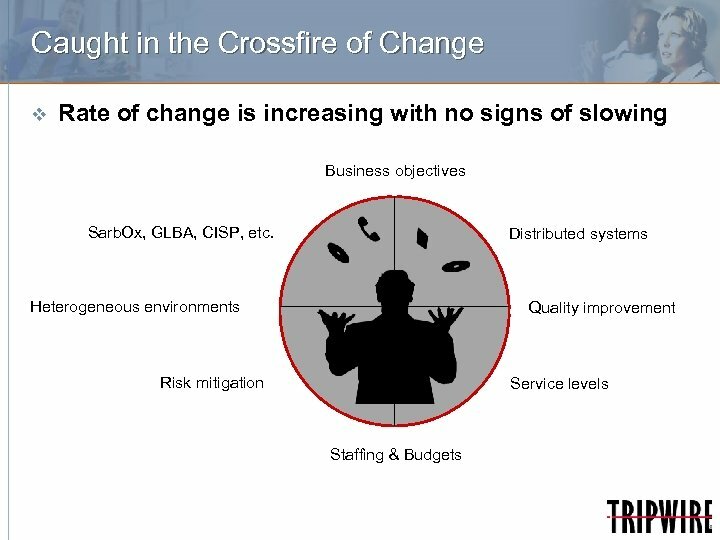 Create Change Team v Get all necessary stakeholders who can best make decisions about changes, encompassing business goals, operational risks, technical risks, etc. 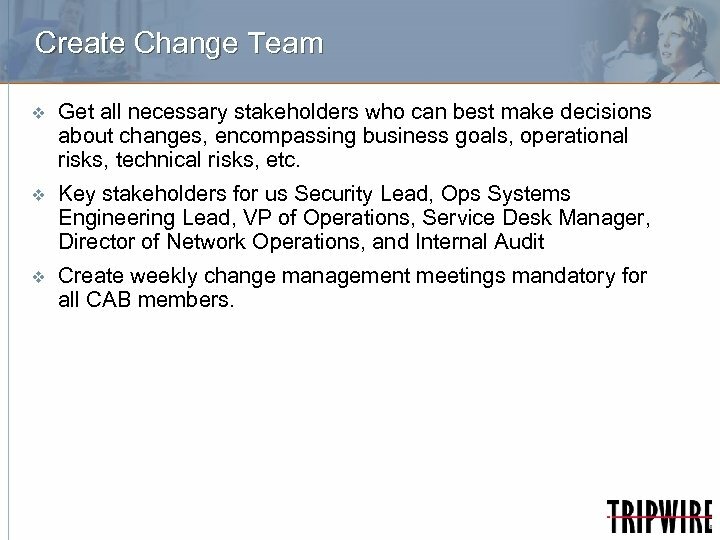 v Key stakeholders for us Security Lead, Ops Systems Engineering Lead, VP of Operations, Service Desk Manager, Director of Network Operations, and Internal Audit v Create weekly change management meetings mandatory for all CAB members. 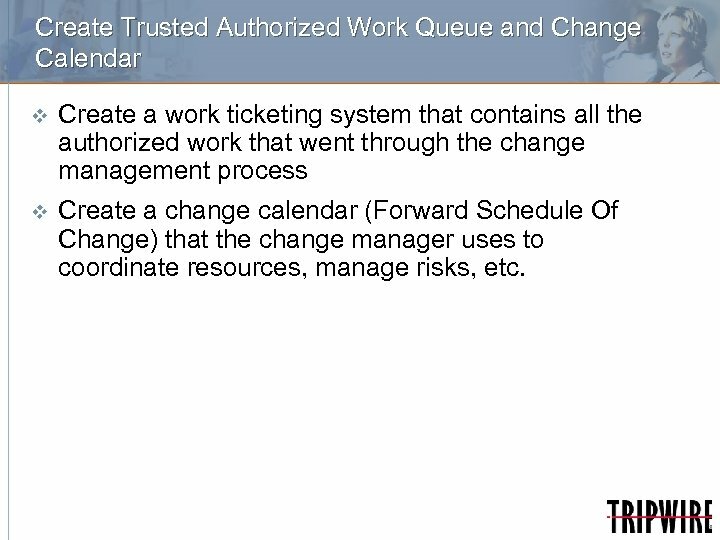 Create Trusted Authorized Work Queue and Change Calendar v Create a work ticketing system that contains all the authorized work that went through the change management process v Create a change calendar (Forward Schedule Of Change) that the change manager uses to coordinate resources, manage risks, etc. 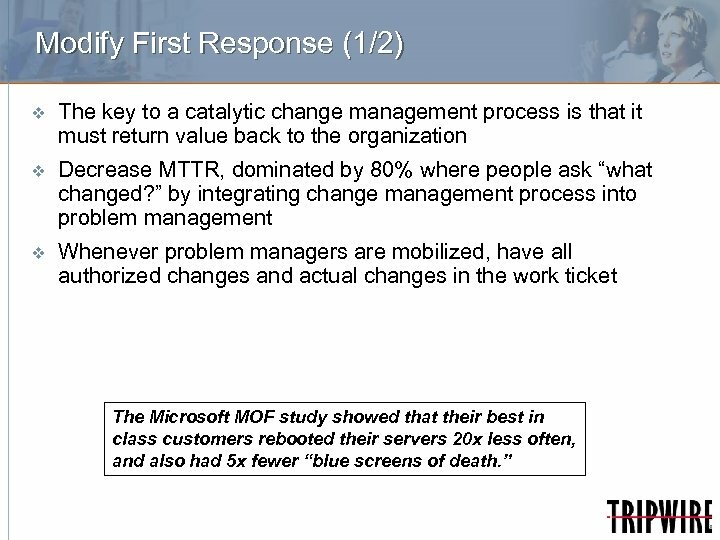 Visible Ops: Four Steps To Build An Effective Change Management Process Phase 2: Catch and Release, Find Fragile Artifacts Phase 3: Establish Repeatable Build Library Tripwire captures known good state in preproduction. 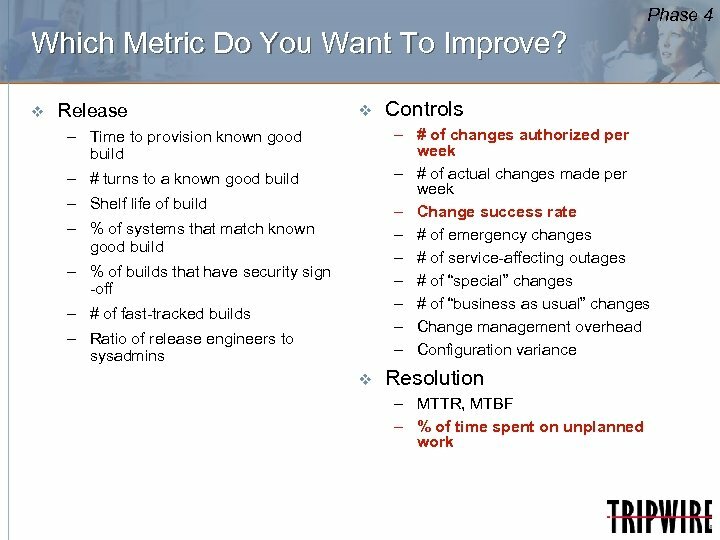 Tripwire captures production changes that need to baked into the build. 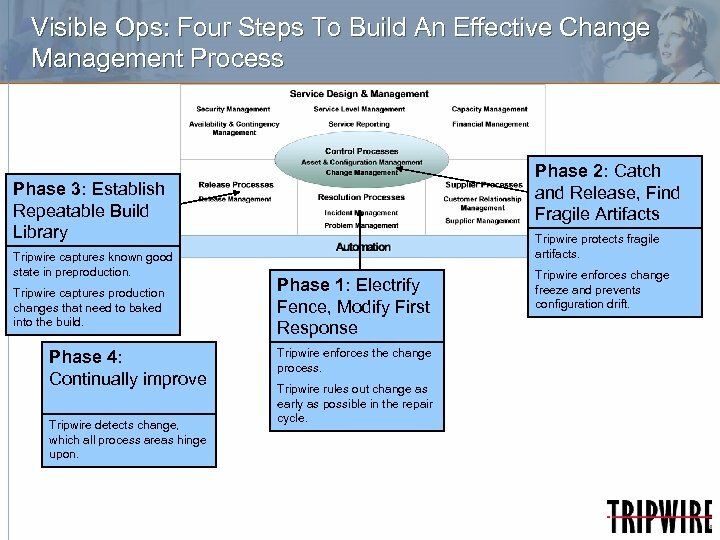 Phase 4: Continually improve Tripwire detects change, which all process areas hinge upon. Tripwire protects fragile artifacts. 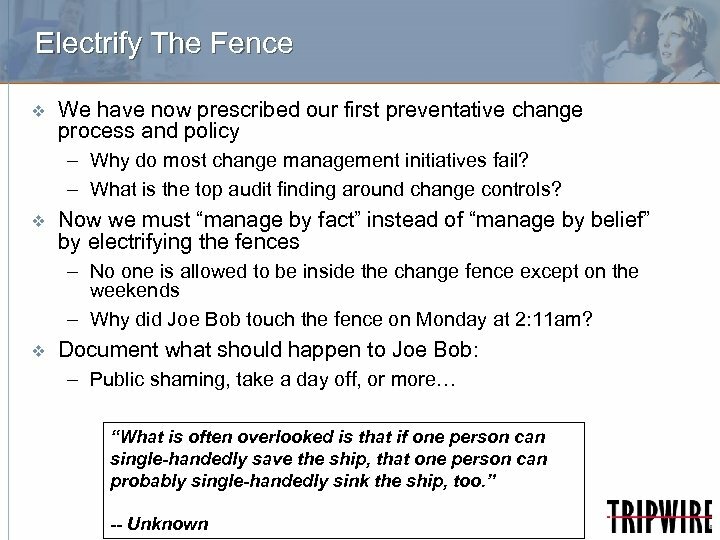 Phase 1: Electrify Fence, Modify First Response Tripwire enforces the change process. 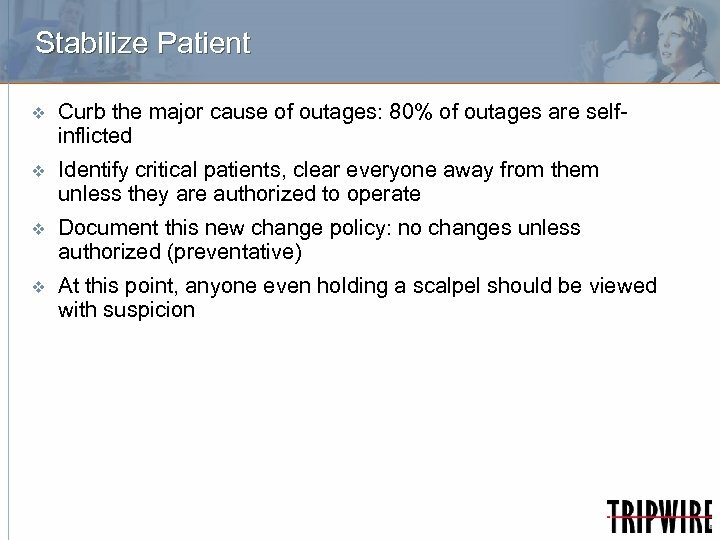 Tripwire rules out change as early as possible in the repair cycle. 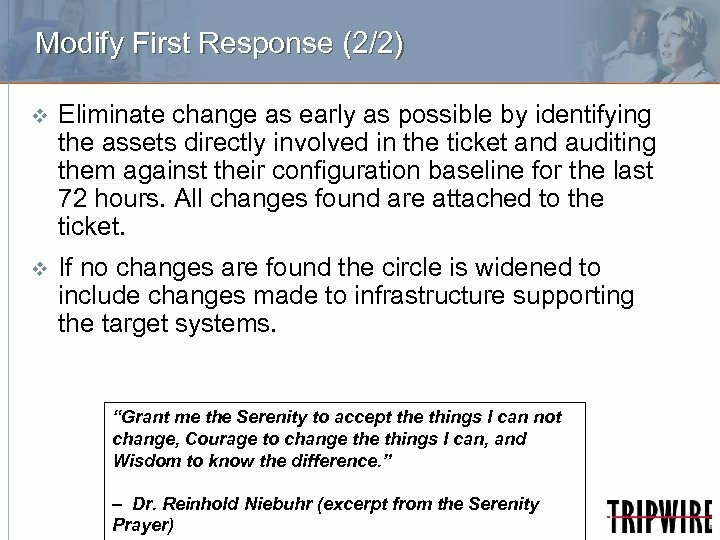 Tripwire enforces change freeze and prevents configuration drift. Get Involved! 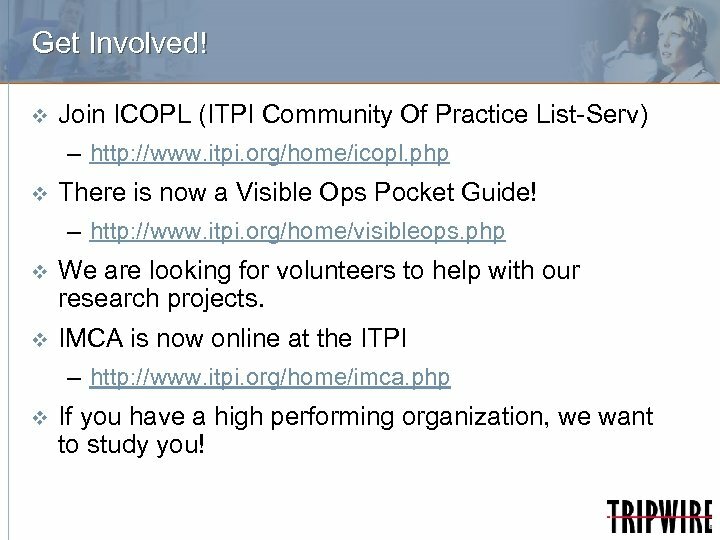 v Join ICOPL (ITPI Community Of Practice List-Serv) – http: //www. itpi. org/home/icopl. php v There is now a Visible Ops Pocket Guide! – http: //www. itpi. 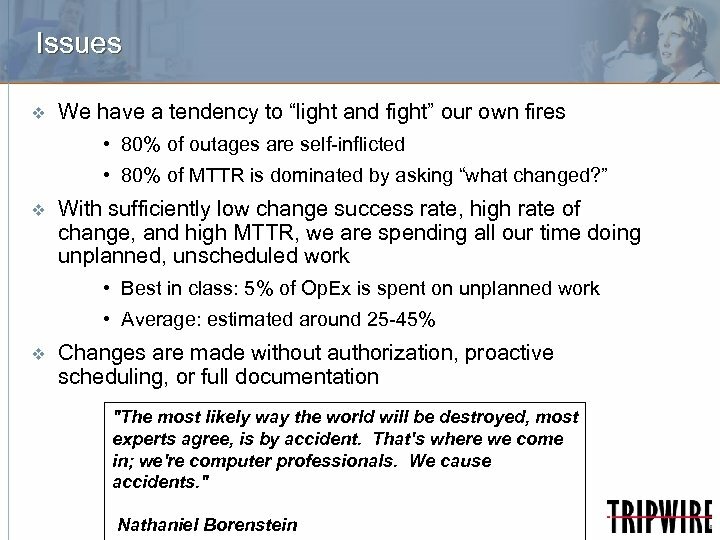 org/home/visibleops. php v We are looking for volunteers to help with our research projects. v IMCA is now online at the ITPI – http: //www. itpi. org/home/imca. 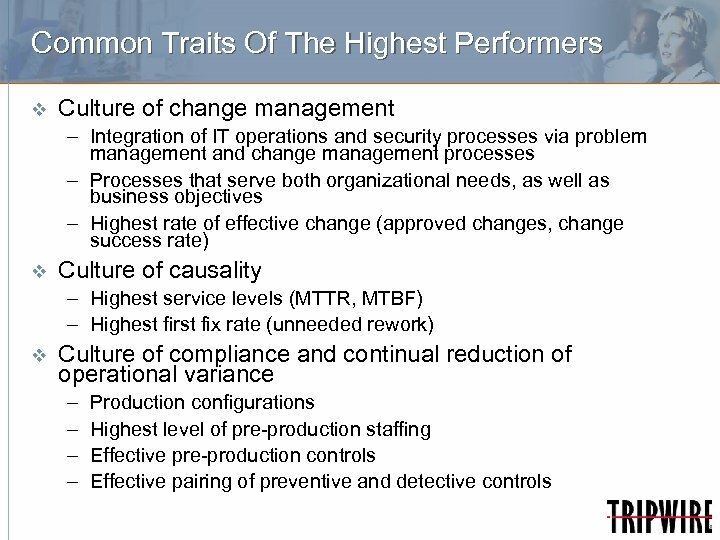 php v If you have a high performing organization, we want to study you!